ODSC Europe offers a unique opportunity to learn from leading data scientists and network with like-minded professionals at events like Dinner with Data Scientists, Meet the Speakers, Meet the Experts, Reverse Startup AI Pitch, networking reception, book signings, and more. Don’t miss ODSC Europe 2018 in London, Sept. 19-22. Last chance to save 30% off door prices ends Friday at midnight. 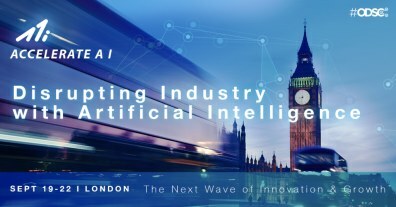 Attend Accelerate AI in London, Sept. 19 (co-located with ODSC Europe) to learn about the next wave of growth in artificial intelligence and the industries on the cusp of AI integration. Learn more. Check out the full schedule and register now for ODSC West 2018.